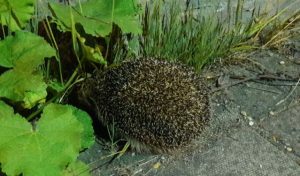 On a warm July evening, as Monica and I cycled back from a planning meeting for NatHistCam, we came across a hedgehog wandering along Devonshire Road near the end of the cycle bridge. It was moving quickly along the edge of the footpath and eventually squeezed under a garden gate and disappeared into the darkness. It looked wonderfully healthy and active. But what about the whole hedgehog population in the city? Is it increasing or declining? 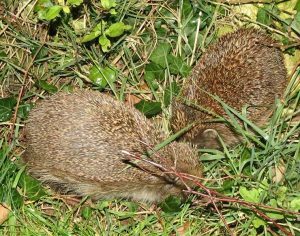 Hedgehog numbers nationally have been in steep decline. Recent surveys have estimated that there are now less than 50% of the hedgehog population that we had in the 1990s. What can be causing the poor old hedgehog to drop in numbers so dramatically? Perhaps it is loss of habitat and a decline in hedgerows. Certainly the reduction in numbers has been greatest in the countryside, where 75% of the population has been lost since the year 2000. But even urban hedgehogs have declined by 30%, so it is not a very wonderful picture. A recent survey by the BTO who record hedgehogs in their breeding birds survey has suggested that the population was around 30 million in the 1950 and that this was down to 1.5 million in the 1990s. That is a huge decrease. It has been said that the decline in the wider countryside is due to predation by the ever-expanding population of badgers. There are certainly a lot more of them than 40 years ago when I first started badger watching. But can this be the complete reason or is it due to habitat loss and habitat fragmentation? The intensification in agriculture is leading to reduced field margins and the loss of hedgerows. There has been a decline in the number of hedgehogs being run over which is presumably due to the lower population numbers. Although maybe they are getting smarter to the perils of crossing the road. So dead hedgehogs in the road are a very important way of discovering where there are populations present. We would like to collect as many hedgehog records as possible. Do you have a regular visitor to food you put out? Or have you encountered a hedgehog wandering through your garden at night? P.S. If you see hedgehogs outside Cambridge city the Wildlife Trust for Bedfordshire, Cambridgeshire and Northamptonshire would like to know. There’s a form for reporting sightings at http://www.wildlifebcn.org/node/15671 .